I’m not a huge fan of using stuffy, professionally design floral centerpieces when I’m hosting a party. To me it always feels like a wedding or a catered affair when I have an arrangement that looks “too perfect.” I prefer something that looks like it came out of my garden or my kitchen- it should to be something that compliments the setting, the menu, the occasion and the company. A few weeks ago, I used this same serving bowl to create a centerpiece with planted pansies. Here, I've used it with lilacs to create a really bountiful arrangement. While most of us don’t have an expansive collection of large beautiful vases in which to create centerpieces, we do often have beautiful serving pieces that we’ve served food in for years. So many times we feel limited by what we don’t have and forget to consider what we do have. Beyond the practicality of using something you already own versus going out and buying something new, I like to use elements from my own kitchen to create centerpieces for my table. Fill the bowl half way with water. Create a grid on the top of the serving bowl with the double stick tape. Place the flowers in the bowl, using the grid to hold them in place. Begin by using the largest blooms and branches to create the shape of the arrangement, then fill in with smaller flowers. Here is the easy to pin strip! How pretty. 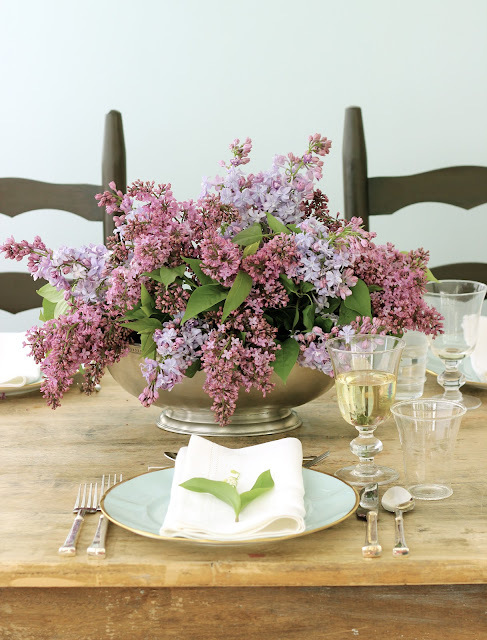 I wish we could grow lilacs here in Southern California...I love the idea of a low, full arrangement in a pretty bowl. I love your site and am a brand new visitor. So beautiful......love the colors and silver as an accent on a table is always a winner in my book! Love your arrangement! The tacos look amazing, and I will try those this week. I am adding you to my blog roll so I won't miss a post. Jenny, check out "The Enchanted Home" blog today. 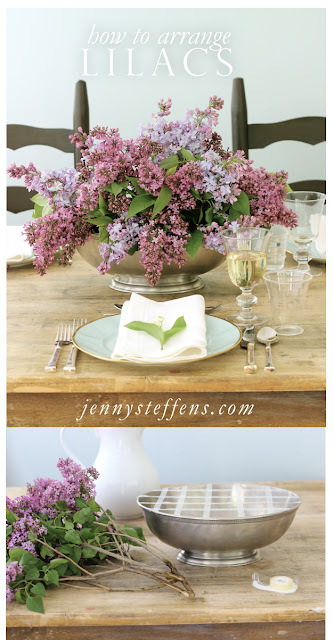 She featured beautiful tablescapes & yours was one of them.....the recent baby shower photo! I recognized it from your blog, but credit was given to "Williams-Sonoma" from your blog w/ them. you are so good Jenny! love your blog! There are people who seriously dislike things that will not even take a meal served from a bowl with some images. Take the case of some societies and their sentiments about the pig.